My parents live within stone-skipping distance of Swisher Creek Alpaca Farms. I had no idea that they had a shop on the premises, so it came as quite a surprise when my mom mentioned that I might be interested in going to check it out. The alpacas aren't normally available for public visits, but every once in awhile, they'll open up the farm for visitors and a market. I happened to be in town one weekend and got to meet several of their alpacas. 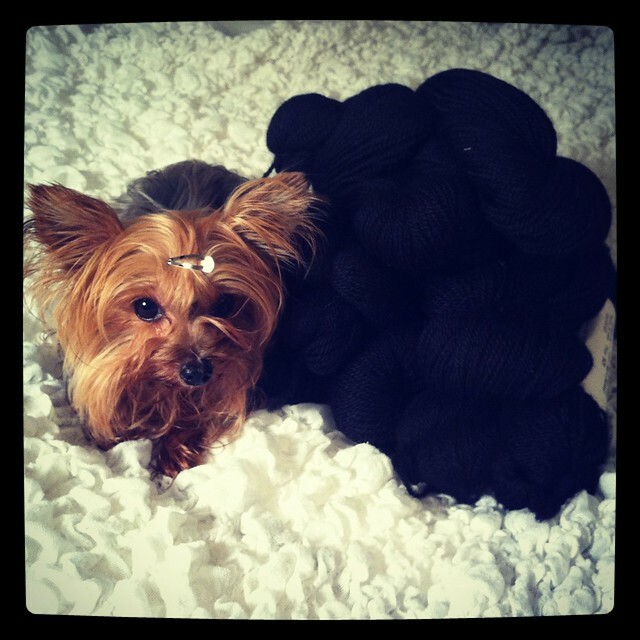 That, friends, is a giant hulking pile of DK weight alpaca, next to my dog (for scale). 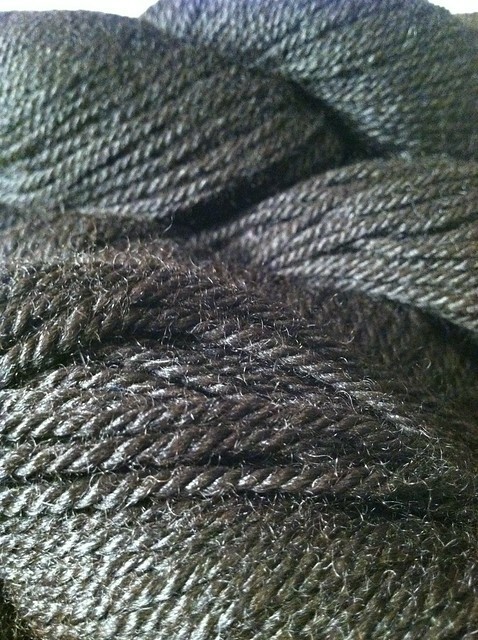 The yarn is gorgeous: it's intensely black, with a bit of a shimmer. I lightened the photo, so you could see the twist and texture. It's lightweight, fluffy, and insanely warm. I have 1600 yards in 8 skeins. 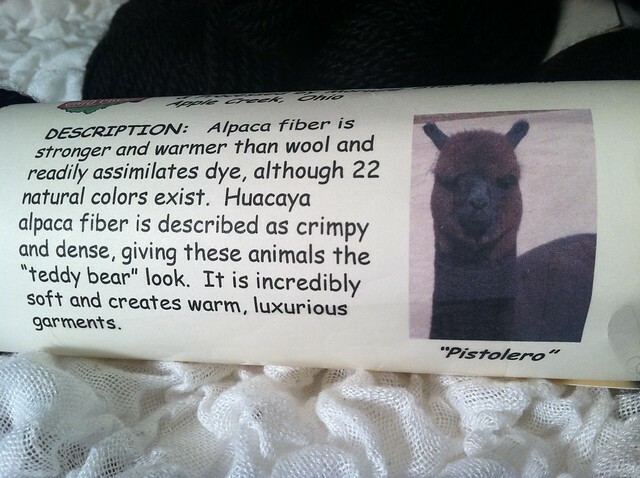 The fiber is courtesy of Pistolero, a Huacaya alpaca that apparently doesn't believe in smiling for photographs. Zephyr by Tori Gurbisz... Remember her? She's the Caliper designer. I like the Autumnal Cardigan. Some texture, but not too much so there's not a lot of wasted effort if it's too dark to see. The sleeves look rather long in that picture, though. I think the length for Zephyr look better, especially since they have a cuff that can be turned back. I know I voted Cassis last night on twitter, but I think I need to change my vote to Zephyr. I'd go for Snowbird or Autumnal. Alpaca has a lovely drape but doesn't really show off textured stitches too well. Zephyr and Snowbird! Knit both and send one to meeeeeeee! 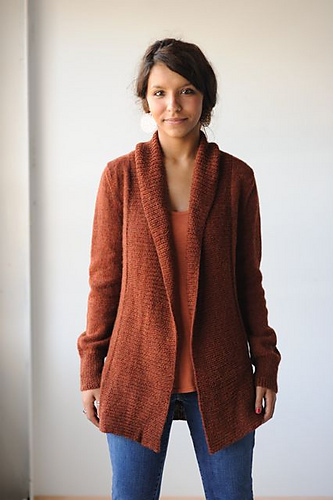 I'm in love with the Autumnal and Zephyr cardigans! I'm also super jealous of your gorgeous alpaca yarn. So exciting! You guys aren't helping me! Now I want to knit them ALL! Maybe I'll just knit one, frog it in a few years, then knit the next one? The ever-changing sweater!